On a calm Tuesday night, “Patient A” felt tired and decided to go to bed at a reasonable hour to get some rest. He was a healthy 49 year old and nothing felt unusual or out of the ordinary for him on this particular evening. At 1:50 AM, he woke up and tried to stand up from his bed but immediately fell to the ground. Fortunately his mother who resided with him heard a loud thump on the ground. She rushed to his room to find him struggling to stand up from the floor. She immediately called the emergency services and requested for an ambulance to help them. We (the ambulance crew) arrived at “Patient A’s” apartment at 2:11 AM and discovered him lying behind the furniture in the living room. A few weeks back, the standard procedure to follow would have been to remove the patient from his apartment, stabilise him and to then transfer the patient to the nearest hospital. After attending educational webinars recently, we were able to recognise that the patient was showing signs of a stroke and therefore the standard procedure would not be sufficient to save the patient’s life. Enthused and excited to put our newly learnt knowledge into action, we knew it was up to us to take on the challenge and act fast, as this patients brain was busy dying. We immediately began to conduct the basic symptomatology tests of FAST PLUS (stroke card); which we had been taught to use. The stroke card helped us to confirm the symptoms of a stroke, gather some key pieces of information that the treating team would need and guided us in determining where to take the patient based on the severity of the stroke. After conducting the tests, we determined which the most appropriate hospital was that could care for this type of stroke and called into the Comprehensive Centre to confirm the intake of a stroke patient. At 2:39 AM in the morning, the ambulance arrived at the emergency department of the hospital with the strokologist on duty from the Faculty hospital in Ostrava, ready and waiting to attend to the patient. At 2:40 AM the stroke team transferred the patient directly to the CT room and begun the process of treating the stroke patient. Without the webinar training sessions, we probably wouldn’t have been able to make small changes in our procedure, potentially resulting in a huge impact on the patient’s outcome. We realised and understood that so many things could potentially have been done incorrectly. We could have missed the signs of stroke, we could have taken the patient to the wrong hospital potentially leading to him not being treated at all or we could have arrived at the correct hospital without notifying them that we are on the way causing tremendous delays in the patient’s treatment, but this time it didn’t. The educational webinars that we attended were part of a series of webinars put together by Dr. Bar, Dr. Václavík, Dr. Holeš and MSc. Jaššo in collaboration with the Angels Initiative. 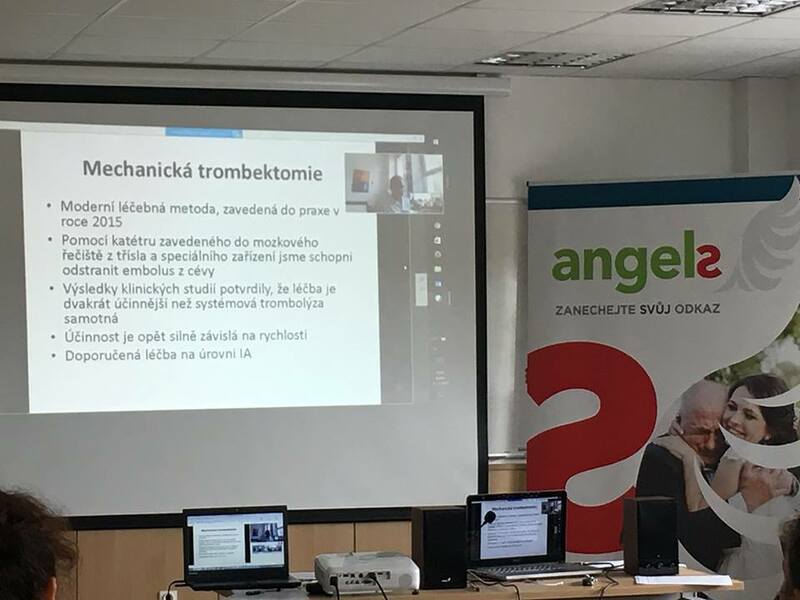 The programme, known as the Ostrava Model, initially struggled to get off the ground but with the combined efforts of Czech Republic Angels consultant, Jarmila Lakoma and the experts, the webinars were successfully launched in February 2017. It has since received incredible feedback from both physicians, who were connected to the main stream Czech Republic stroke network as well as from the emergency services teams, who have found great value in the programme. The webinars allow emergency services teams the opportunity to conduct interactive discussions with neurologists, ask questions and gain clarity on things that they are unsure of as well as to discuss real cases and challenges that they are met with in the field. Through these educational webinar sessions, we are able to empower the emergency services teams and demonstrate to them the integral part that they play in process of treating a stroke patient. By doing this, we give them the motivation and encouragement to go into the field and make a difference. We have also implemented a feedback loop where directors from the EMS services and the hospitals have a dedicated email address that they are able to report good and bad cases that they have dealt with. Through this channel, reports are received giving updates such as where the agreed protocols were followed, such as the case of Patient A or when a hospital in the network declines to receive stroke patients for some reason. This provides valuable in field feedback and is used to improve the network. The webinar training together with the open and honest feedback is revolutionising our pre- and in hospital stroke network. This is my motivation every day – to go out there and make a difference. I truly believe we gave the gentleman a better chance to live. Author: Mr. Jaššo, who was one of the team members that assisted Patient A.